Makes: Makes 1 1/2 - 2 dozen tarts. 1To make the pastry, in a large bowl stir together the flour, sugar and salt. Add the butter and blend with a pastry blender, fork or your fingers (or pulse in the food processor) until well blended, with some pieces of fat the size of a pea. Drizzle in enough water to make the dough hold together - you'll likely need almost all of it. Shape the pastry into a disc, wrap in plastic and refrigerate for 30 minutes or overnight. 2On a lightly floured surface, roll the dough out about 1/8-inch thin; cut into 3-inch rounds with a cutter or glass rim and fit into muffin cups. Reroll the scraps only once to get as many as possible. Preheat the oven to 375F. 3To make the filling, in a medium bowl whisk together the eggs, brown sugar, maple syrup, butter, lemon juice and salt, stirring until smooth. 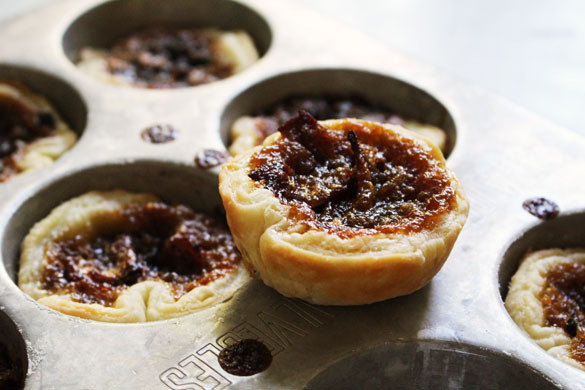 4Sprinkle some chopped, cooked bacon, currants, raisins or pecans into the bottom of each pastry cup and fill with the filling mixture, filling almost full. Bake for 20-25 minutes, until golden. Remove from the pan while the tarts are still warm.